The Clinton County Middle School Site Based Decision Making Council held a special call meeting Thursday night, January 26. The meeting was called to address the dress code policy that is in place at the middle school. More than 20 parents were on hand Thursday night to hear the council and to voice their opinion on the matter. As it is now, the middle school’s policy on having holes in pants/jeans is a zero tolerance policy. The uproar about this policy has come within the past two weeks as anywhere from 20-30 cases of students with holes in their jeans have been reported to Principal Pam Bale. Bale stated in the previous weeks that several students have been purposely cutting holes in their jeans in order to get out of doing classroom work. 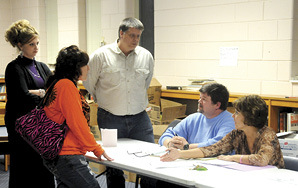 At five p.m. Thursday, the meeting was called to order with all members present. Principal and SBDMC Chair Bale started by reading the board’s policy on civility. Following the reading of the board’s policy, Bale read the wardrobe policy that is sent home with every student at the beginning of the year. Before Bale opened the meeting up and asked for the public’s input, council members stated their opinion on and commented on the dress code. Council member Tim Duvall said there have been several policies in the past and most all of them hve come with opposition. Following Duvall’s statement, councilmember/teacher Lonnie Brown said the school has had policies where holes in the knees were acceptable. Following Brown’s statement to the parents and public, councilmember Jerry Stearns, who has been a part of the SBDMC since 2004 minus one year, spoke about his opinion about the policy. Stearns disagrees with the policy and thinks it should be amended. After Stearns spoke, the public got involved and started firing questions at the board members. Some were asking how this policy could be fair while others were putting blame on the teachers for wearing tight fitting shirts. One parent stood up and told a story about how his child had gone to a teacher and explained to the teacher about accidently ripping a hole in his jeans. That child was sent to detention for having a hole in his jeans. After several parents spoke and voiced their opinion, Bale addressed the parents and said she didn’t disagree with anything they were saying, however, she said she had to enforce the policy that was in place. Bale said she tried to be consistent at the beginning of the year up until one child’s parents couldn’t bring the student a pair of pant, there for putting the child in detention for the remainder of the school day. Kenny Stinson then mentioned the idea of having individual punishment for those who clearly opposed a dress code. “But you can’t punish every student for it,” Stinson said. 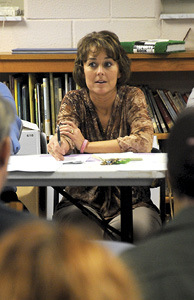 Angela Sloan was also on hand for Thursday’s meeting and voiced her opinion on the matter. One concern many of the parents had was the economic aspect of the policy. Several parents said they couldn’t afford to buy pants for their child every time a small hole is torn in the leg of their pants. After several more parents voiced opinions and asked questions, it was clear the same concern was on the minds of the parents who attended the meeting. Jennifer Harlan made the point that some of the kids who are cutting holes in their pants on purpose are getting a reward by not having to go to class. Other than the economic aspect brought up at the meeting, the physiological aspect was brought up as Greg Claborn made his statement. Claborn went on to say he believes when the policy was written there wasn’t any ill intent, but, he said policies can be rewritten everyday. Bale said several times during the meeting that she is there to facilitate in providing an education for the kids of Clinton County. As the meeting continued, it was clear a new policy would probably be drafted. Bale said the teachers voted for the “no holes” policy to keep from spending a lot time talking about and looking at dress code issues instead of teaching. Bale said once the students were sent to time out, they were given their assignments to complete while in detention. “The day the phone call came that I think caused a lot of the eruption, we had students purposely taking scissors and cutting holes in their pants so they didn’t have to give a speech,” Bale said. “Those students who didn’t have their speech were assigned Saturday School. If you don’t complete your assignment, then you go to Saturday School to complete it. Once that was assigned, I had an office full of parents that looked me in the eye and said ‘I’m not sending my child to Saturday School.’ So, there went the instructional purpose of the speech. After about an hour and a half of hearing both sides, an unexpected event happened that put a stop to the meeting. A woman who attended the meeting, presented with drawing of the face and left hand. As soon as the situation was recognized, an ambulance was called to the meeting to provide medical attention. It is not clear what brought on the medical condition of the woman and her condition after the conclusion of the meeting was unclear. Once paramedics took the woman into the hall, several comments were made to conclude the meeting. The one hour and 48 minute meeting saw the council agree to rewrite the policy. The policy has to go through two readings and then a vote to adopt the policy is made during a meeting. The policy will take a couple of meetings before it is ready to be enacted. Until that time, Bale said the current policy in place will be what administrators have to go by if any more situations come about. At 6:48 p.m., Moons made a motion to adjourn and the motion was seconded by Brown. The next regular meeting for the Clinton County Middle School SBDMC will be held on Monday, February 20. The meeting is open to the public.